57 & 85 x 66", 1800 hp at 35 rpm engine by Rankin and Blackmore Co., Greenock, Scotland 1887; engine from CIBOLO. 8'9" by 17' boiler, 90 # steam by Inglis and White, Montreal, QUE (1888). Engines were built in Scotland for the CIBOLA (1888) transferred to this vessel when CIBOLA burned. 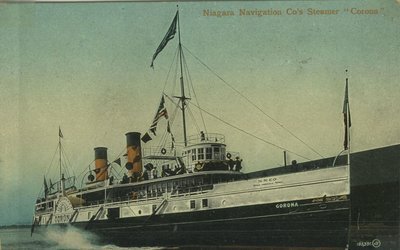 1913 Owned Canada Steamship Lines. Ran Tononto - Niagara. 1920's Ran Toronto - Hamilton run. 1927 Refitted and ran Toronto - Niagara. 1928 Laid up at Toronto Ship Canal. 1937 Owned Frankel Brother's Ltd, local scrap dealer.